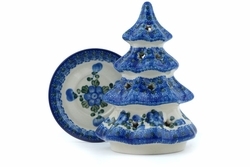 Christmas Tree Candle Holder - this unique hand painted Polish Pottery piece is Holiday Season's favorite! A beautiful presentation and a practical gift. Place a tea light in the base and the holes on the tree will give an appearance of a Christmas Tree with Lights on! Each candle holder is hand crafted at famous Ceramika Artystyczna factory where artisans rely on time-honored techniques to meticulously decorate it by hand.